We all know that water is crucial to survival—but what happens when arsenic gets in the picture? Arsenic is a naturally occurring chemical component of many minerals, so it can leach into ground and surface water. The chemical can also enter water supplies with industrial waste. Prolonged exposure to arsenic has been linked to many health concerns, including digestive problems and numbness in hands and feet. It is also thought to be one of the leading causes of cancer worldwide. In the United States, concentrations of arsenic in ground water are generally higher in Western states than the East. 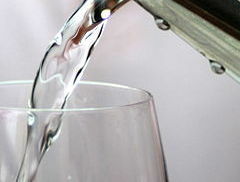 Municipal water is tested and treated for arsenic, but private wells are also at risk and should be tested before use. So take the safe route: Get your water tested and buy a water filter that serves up the cleanest water possible.